Still, I’m guilty of having done this kind of calculations, often with depressing results, no matter how generous I was with the estimates. And even if I can’t deny that being trans and lesbian lowers the fraction of people available as a partner by a big amount, I’m sure I’ll find the right person, somehow, sometime, somewhere… maybe. Most people also face extraordinary odds to find their match. The difference, dear, is if and when you meet her, she will see the real you. Unlike most people, you don’t have to worry about anyone falling for an illusion. 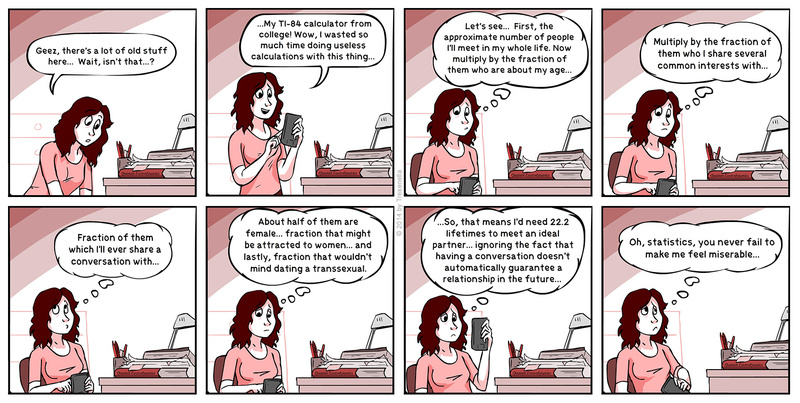 I’ve had this same conversation with a calculator. My advice: Don’t let a calculator tell you the odds of finding love. as a trans guy who likes other guys and is oten wanting to do seemingly random activities (like I’ll sit and do polynomial divisions just for fun, but then will also spends hours watching mindless anime) I often feel like I wont ever find anyone. Gotta live in hope though!